“Breathe in, and enjoy breathing in." Patrick Cassidy Sensei, from Aikido Montreux, was here teaching a seminar recently. While instructing us in an ukemi exercise he told us to do something (basically a way of rolling around smoothly on the mat), and then he added the instruction to “enjoy doing” what we were doing. It’s something I’ve been exploring since: Enjoy driving to work. Enjoy washing your hair. Enjoy pulling weeds. I was reminded of it this morning, when Thich Nhat Hanh, a Buddhist monk, was leading a meditation at the Plum Village Online Monastery, and gave the instruction above, about breathing. This is really too good to keep to myself. Click the title, above to go to a very simple, elegant, and reassuring website. Enjoy. How to flow around obstacles. How to be the center around which things flow. In deciding who we are, we also decide who we are not. There are important parts of our selves that don’t fit the persona we try to show to the world. But like light and shadow, both make up the whole picture. What qualities have we set aside? What is available there, that we’ve been afraid to bring out in the open? What gold is hiding in our shadows? We’ll be using the context of Aikido to explore our shadows in one of Goldberg Sensei’s always intense and transformational Aikido In Focus workshops, “Aikido, Fear, and Freedom,” coming up on September 11, 2011. I’m looking forward to getting acquainted with my shadow self. These weapons are my 3rd kyu / 49th birthday gift to myself. They are from Kingfisher, where you have the option of having them inscribed with any of a zillion words or phrases. 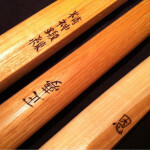 I can’t read them, but I hope the bokken, at the top, says spiritual forging, a primary focus in training. The tanto, at the bottom, says kindness, grace, or mercy, a reminder for dealing with attacks of all kinds. The jo, in the middle, says a dream that comes true, which is what Aikido is, for me.